Blog: Fan blades draw air in through an inlet duct, through a filter, and the newly cleaned air finally enters a sealed storage room as a chilled cloud. In Melbourne, fan coil units only require a handful of parts, mechanical assemblies wrapped in a compact housing, to maintain this cooling fan coil cycle, but every single stage is susceptible to system-deteriorating factors. Someone must assume the process of cleaning, inspecting, and maintaining a dirty coil unit so as to protect the cold store materials. This is the purpose of an all-encompassing fan coil unit maintenance plan. Physical assemblies and electrical subsystems work in harmony in this scenario. The cable insulation is checked for cracks and scrapes, weakened spots that can cause a dangerous short-circuit, especially when high-conductance condensation is part of the local environment. Ball bearings take care of the fan, but they should be sealed or greased, so disassembly and lubrication is a non-issue. Conversely, the fan belts that tie the motor to a segregated fan unit are apt to wear. Tighten the linkage between the units because vibration wears the fasteners. At some point in the not so distant future, replace the fan belts and reestablish the tension in the belt to stop slippage. Ensure that no water enters the electrical motor terminal box as the treatment is applied. 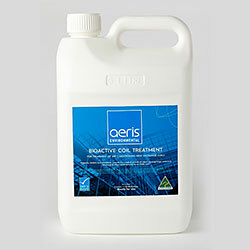 We highly recommend Aeris treatment administered by a trained, Accredited Applicator such as Coolclean in Melbourne. Coolclean’s five step AerisGuard process cleans and stops the spread of bacteria and mould at the source of distribution – the fan coils/evaporator units. Aeris hygiene products not only clean but disinfect and protect cooling equipment at the source, actively controllling mould and bacteria within the units on an ongoing basis. The benefits of Coolclean’s AerisGuard treatment can be seen here. Replace filters, obviously, to stop outdoor contaminants from entering the cool room. Check supplementary internal filters and replace as dictated by the cool store maintenance plan. This last case is a common part of a preventative maintenance strategy, a plan that stops inconsequential issues from developing into full-blown major system headaches. The continued integrity of the unit pan and drain line stops spores and microbial growths from prospering, thus retaining the cleanliness of a storage area that may contain food or pharmaceutical items. In short, chilled water and DX system hygiene is everything, so keep every hidden piece of equipment inside the housing clean and sanitary. Fan coil unit maintenance absolutely depends on this level of deep-system care and treatment. A powerful maintenance procedure protects against threats and cleans the contaminants that enter from the outer atmosphere, but the cold storage space introduces its own threats. Food and growing produce throw spores and mould-inducing bacterial components into what is essentially a sealed environment at Laverton. Combined with the condensation generated within the unit, this unique environment could rapidly become a germ factory without a meticulously applied fan coil unit maintenance strategy in place. It is important to maintain the finned copper coils by fitting a pan tablet, and to pay special attention to periodic drain pan clearance routines and to ensure every inner surface is deep-cleaned.